Mere Christianity is one of those books that you hear about all of the time. So many have pointed out the simplicity of his arguments while referring to the depth of his conclusions in the same breath. Even the reviews already given on this site applaud this work. I could sing the praises of this book as well because I felt that there were little light bulbs coming on as I encountered each new point as Lewis completed a few circuits in my mind, but I feel that I need to mention more than the book. The fact that I encountered this book in audio form has played into my enjoyment of the book. 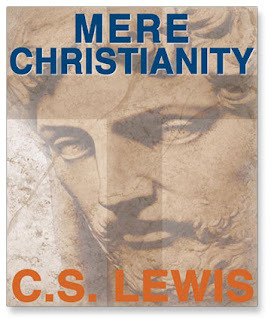 Mere Christianity was originally a series of radio broadcasts. So as I listened to the recording, I almost felt like I was listening to Lewis giving those original broadcasts. I highly recommend this book, but even more highly I recommend the audio version of this book. I have a hard time writing reviews. I always feel like I need to be really profound so I end up writing and rewriting every single sentence. But even if the review itself is lame, the book is totally worth the time. Check it out. A simple review and recommendation is usually better than a review that tries to be clever but only leaves the reader baffled.